You guessed it, our family is expanding! Not by one, oh no that would be too easy, we’re adding two! When I say “family” and “we” I am not exactly talking about the “family” and “we” that consists of just Todd and I however, I am actually referring to my immediate family outside Todd and myself. More specifically, my brother and sister in-law. And when I say the family is expanding I mean as of tomorrow! Crazy right?! One day you don’t have twins and the next day you do. It is all happening kind of fast because these twins were not expected but here they are and tomorrow they are coming home. Now that I started this post in the most confusing manner possible, allow me to explain what exactly is going on. In a recent entry, Half Agony, Half Hope, I referenced news I received that caused the wind to be knocked out of me. I can share now that it was in reference to this situation. At the time we, my family, did not have all the information and did not know what was going to happen so I did not want to share too much but now that things are a bit more figured out I feel better about sharing. A family member who does not keep in contact with the rest of the extended family apparently had twin girls at the beginning of December. My extended family was not only unaware of this, no one was even aware she had been pregnant, let alone with twins. This was the initial news that left me breathless. This family member has been ill for sometime and it was determined by the state (DCF or whichever agency makes these kinds of determinations) that she will be unable to care for the newborns. This was the piece of news that broke my heart. I could not imagine carrying two babies for close to 9 months and then immediately after their birth being told they would be taken away. With this determination the state agency in charge of placing the babies with care givers started looking for family to see if anyone would be able to take the babies. If they had been unable to locate family then the babies would be placed in foster care. Fast forward a bit, my brother and sister-in-law agreed to take the babies and as of tomorrow they will be coming home. My family member, the mother of the twins, was overjoyed when she heard it would be my brother caring for her babies which made me feel much better about the situation. My heart was and still is so broken for her but I am glad that she is comfortable with how the situation is being handled for now. I am also thankful that my brother and sister-in-law have met with her multiple times and spoken by phone with her as well in an effort to establish how she would have the babies cared for and they plan to do their best to respect her requests. I am so thankful. I am so thankful someone is watching out for her and listening to her wishes and taking her into consideration in all of this. She is still their mother, she is just ill. I feared she would feel like her babies were being stolen away and that she would have no say in how they were being raised but that is not turning out to be the case. It is still a foster care type set up for the time being except the babies are with family instead of being placed by the state. As it stands the future, long term and short term, is unclear. 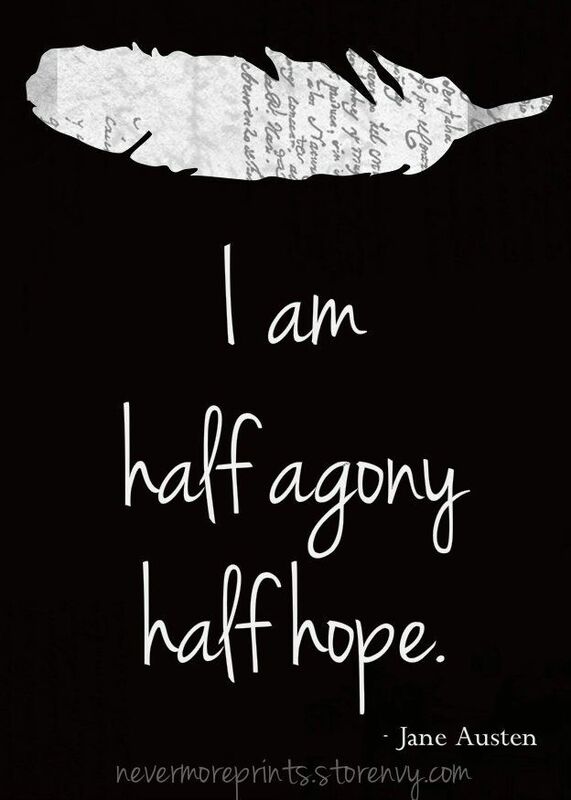 But for now I can gratefully say that I am feeling much more hope than agony about it all. It is going to be day by day for a while I think. Right now I am looking forward to meeting the girls, Cassandra and Emma, tomorrow and we will see where things go from there. Regardless of if the girls stay with my brother’s family long term, which they are agreeable to, or if they are placed back with their mother at some point, the family is still expanding by two and that is exciting. Today I planned to just be packing for Chicago, we leave Tuesday, and straightening up the house a bit. When I got the news the girls would be here tomorrow I took a break to shop. Personally, I have never been a fan of traditional baby girl clothes and accessories in terms of “girls have to wear pink and purple and boys wear blue etc”.. I think it’s ridiculous, I happen to love a baby girl in navy blue. When I shop for babies and children I try to find things that go against gender stereotypes in terms of clothing and I always get books. For the girls I found coordinating, not matching mind you, I figure these two are going to be stuck wearing matching outfits for years to come so I didn’t want to go there. So, like I was saying, I found them coordinating sleepers. I also got them a board book about trains and a Pride and Prejudice board book, it’s never too early to get started on Jane Austen. I also found them some sparkly red flats that I could not resist for two reasons. One because they were fabulous and two because I just got Maddie a pair for Christmas along with The Wizard of Oz book so now she and the girls will match and I know Maddie will love that. So it is exciting times. To be clear again, Todd and I are not expecting but yes, the family is expanding by two. I am looking forward to meeting and loving on these little girls and then off to Chicago we go. Busy and exciting times. Further Misadventures of Calamity Jill: If It’s not Lost, It’s Broken. In our house I am the reason we can’t have nice things. This has been true for me my entire life. I have always been the reason I can’t have anything nice and I am usually the reason why it is difficult for anyone I live with to have anything nice. It turns out to be quite fortunate then that I have never been a girl with expensive taste. Impeccable taste, oh yes absolutely, I pride myself in my good taste. But expensive, no never. It is also quite fortunate that nice and expensive are not mutually exclusive. When Todd and I were dating and we both knew marriage was on the table I explained to him that my engagement/wedding ring would be the only real jewelery he has to get me. The title of this post is why I do not wear real jewelry. It’s true, that for me if it’s not lost it’s broken. I have owned four pieces of real, expensive jewelry in my entire life.. My wedding ring set (obviously), a bracelet bought for me by my parents and a Tiffany necklace that was bought many Christmases ago by an ex. The bracelet did not make it a week. I was wearing it in a car with my arm partially hanging out the window when I accidentally banged the clasp against the door causing it to break. The bracelet fell out of the moving car into busy traffic and was promptly run over. I was heart broken. Not because of what it was but because it was from my parents and that gave it sentimental value. The Tiffany necklace, although lovely, should have been a hint to me that the person I was dating did not know me at all. I wasn’t impressed by the fact that it was Tiffany’s, I just liked that it was from him. He could have bought me a sock, just one sock, not even a pair, I would have regarded it the same way I did the Tiffany necklace, I love it because it is from you not because of what it is. Needless to say, true to form, I lost the Tiffany necklace about a month after it was given to me. Now this took some skill because I wore that necklace everyday. Never the less, I lost it. 3 months later I found it under my night stand covered in dust (I clearly didn’t spend much time under my night stand cleaning). After those two incidents I decided that was it for me and expensive jewelry. It’s too much pressure and I value it the same way I value fresh cut flowers. Save your money and just get the flowers was my approach to conventional romantic gifts going forward. And my parents, while understanding about the bracelet catastrophe, learned their lesson as well. Now here I am on my third and fourth pieces of expensive jewelry and wouldn’t you know it, in 8+ years I haven’t changed one bit. I am no less clumsy or more trustworthy with costly merchandise than I was back then. 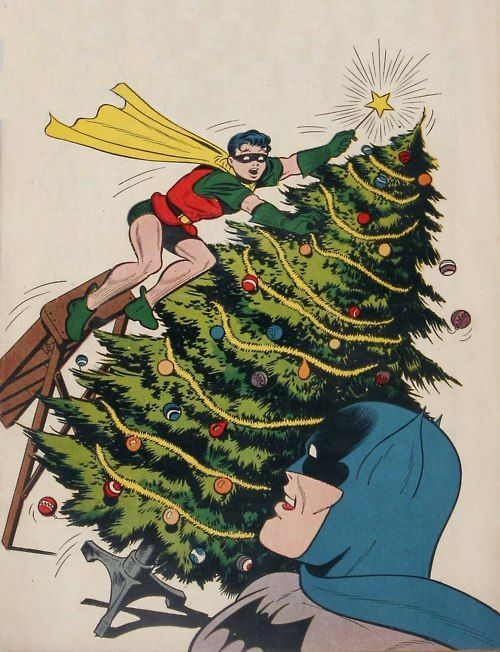 I blame it on the attention-to-detail issues I have always had. I have had my rings for a relatively short period of time (one over a year and the other about a month) and already I have managed to crush the band. That’s right folks, I crushed platinum. Don’t ask me how for I have no answer. I just looked down and noticed one of the diamonds on my band was not shining as brightly. Upon further inspection (by Todd) we realized I had crushed one side of the band, completely obliterating the milgrain that was previously there. And in doing this I also apparently jostled one of the diamonds which is why it looks different. I am very thankful that I married someone who truly knows how calamitous I am and therefore spared me the lecture and just started the process of filing a claim with the insurance. I love that man. I am a little bummed that I will have to send my ring away to be fixed but I am not surprised by any of this. Guaranteed this will not be our last claim filed with the jewelry insurance either because this is me, I am rough and haphazard and these diamonds are in for a bumpy ride. You know, what I said at the beginning about not being able to have nice things is not completely accurate the more I think about it. I have plenty of nice “things”. I have an incredibly nice husband, I’d venture to say he is one of the nicest. I also have a nice family and over all a very nice life. Lucky for me the nice “things” I have are durable and flexible and forgiving which means that no amount of calamities I can throw at them would cause them to ever become broken or lost. For that I am thankful. The Honeymoon Part III: Surrounded by Books, an Introvert’s Dream. As the title describes we did surround ourselves by books on more than one occasion while honeymooning. And on at least one occassion we truly were surrounded! 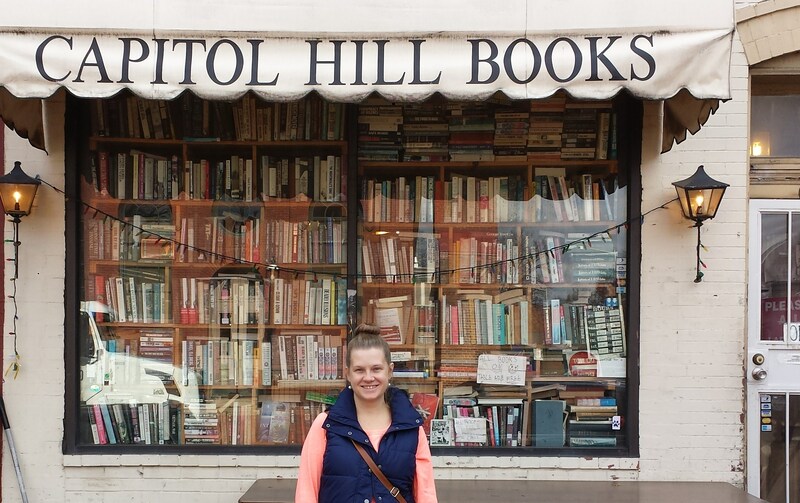 Capitol Hill Books was one of my desired destinations to visit while in D.C. it is in the Eastern Market neighborhood which was about 10 blocks from our brown stone. 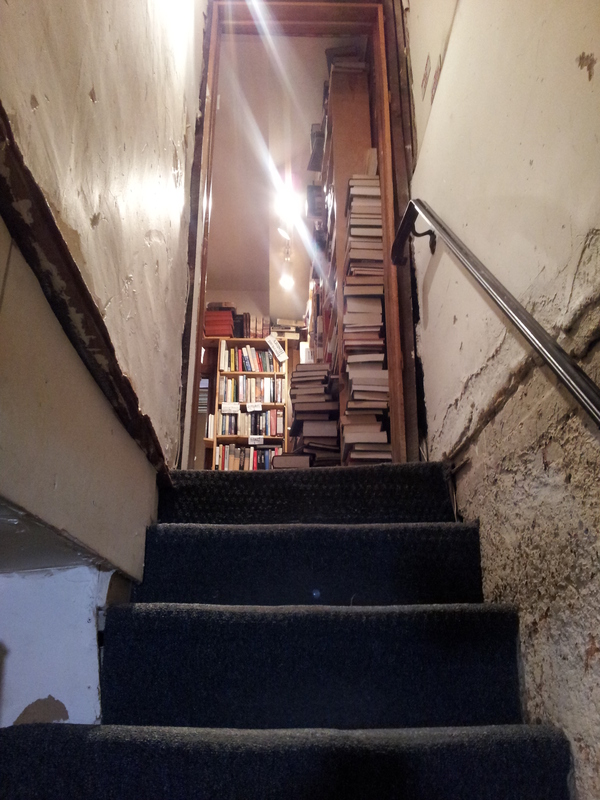 I had read about the floor to ceiling books the store boasts to hold but was unprepared for what being that engulfed would be like. I am not claustrophobic but if I were there is no way I would have been able to set foot in the store. 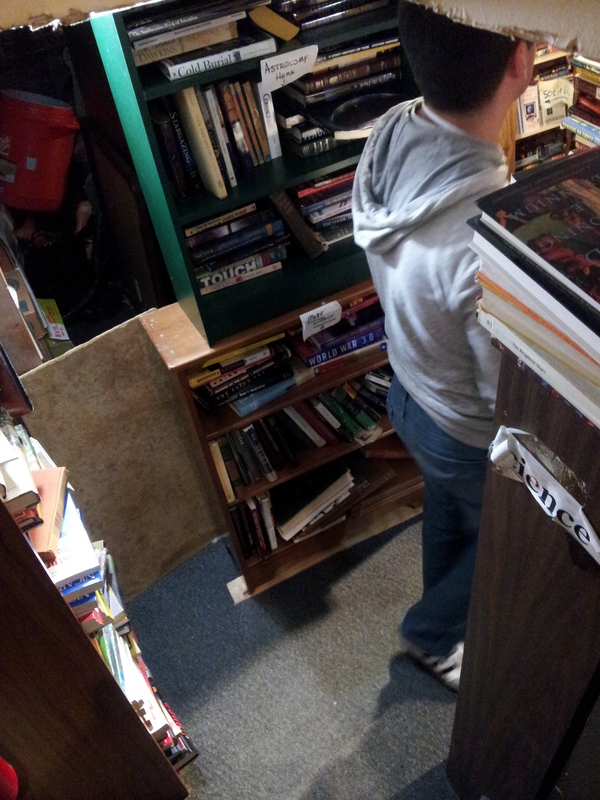 Capitol Hill Books is the most stocked used book store I have ever visited. Now I can claim it to be the best stocked because I unfortunately did not find anything special enough to purchase, as I had so hoped. 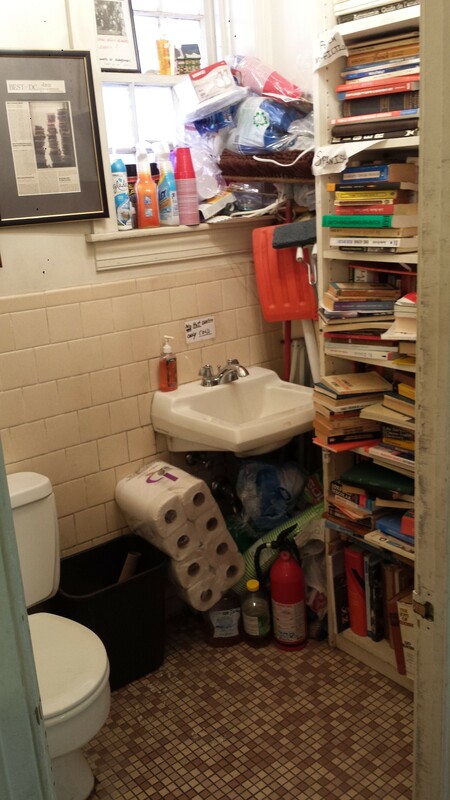 This book store ended up being more about quantity than quality. It was neat just to look around though. As you can see from the bathroom no room was off limits. This was a hoard if I ever saw one. 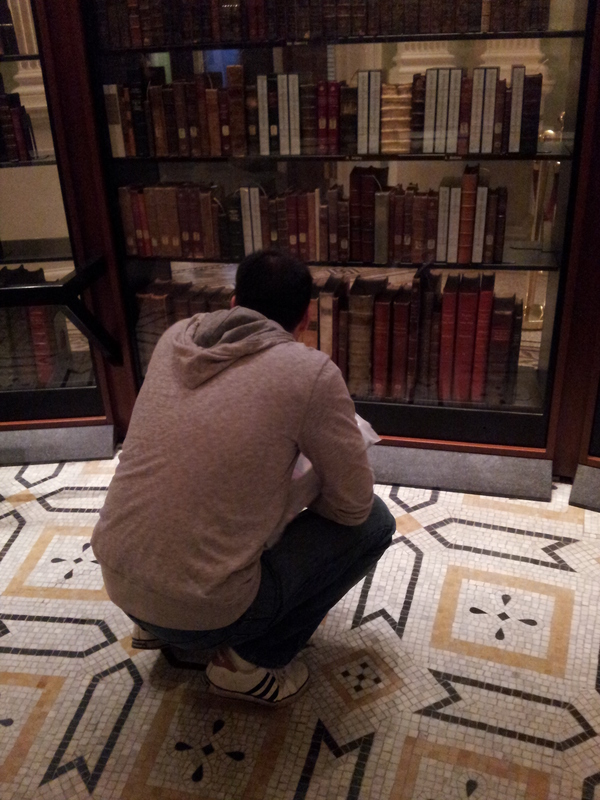 We also made sure to visit the National Library. We got to walk through and look at Thomas Jefferson’s personal library, some of the originals were present which was neat. 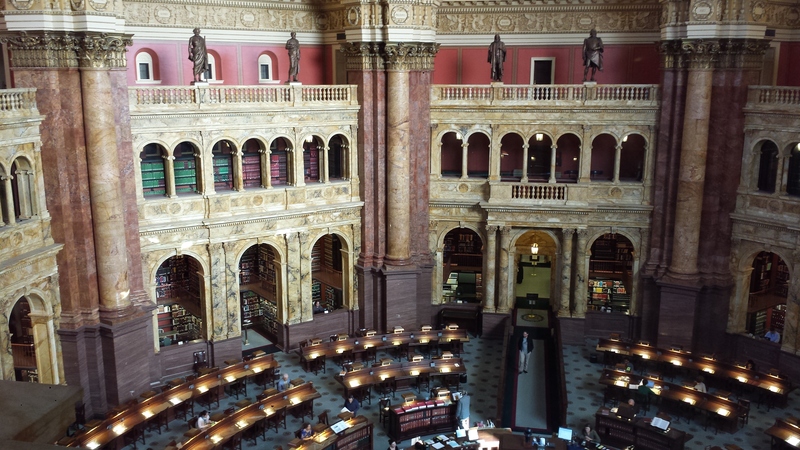 The main library itself was impressive. I so wished we could have gone down and looked around. The room was stunning and so quiet, it seemed serene. 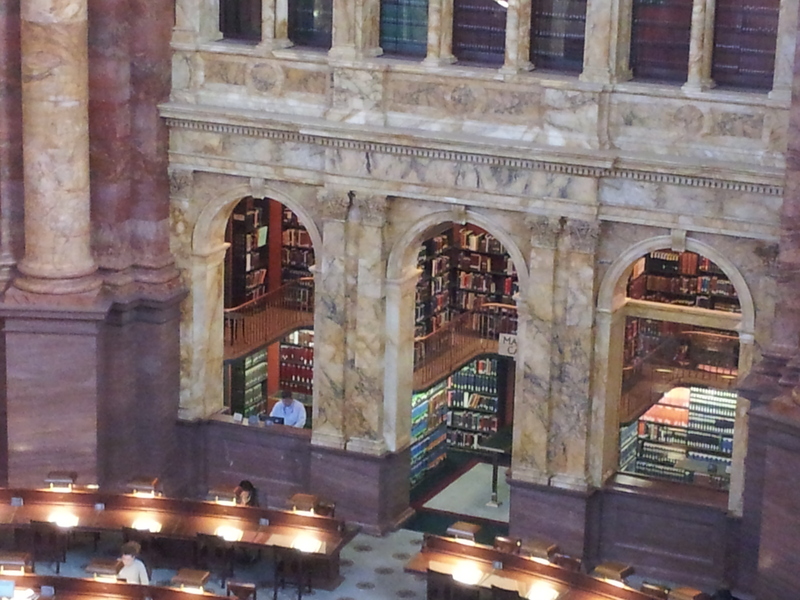 When I worked at the MRI facility one of the most interesting patients I had the pleasure of talking with was an older man who was retired from working at the Congressional Library. In truth I spent more time socializing with his wife as he was on the table being scanned but he certainly seemed to have lived a fascinating life. I thought of him as I stood there in awe. I imagined how wonderful it must have been to have a job like that. A few days later we had intended to spend the afternoon doing some shopping, there were a number of vintage boutiques I had read about that I was dying to patron. That was the one day of disagreeable weather, which in turn worked in our favor. Although I did not visit all the shops on my list due ti distance and us trying to stay out of the snow flurries we did end up at a few book stores. Kramerbooks and Afterwords Cafe had always been on the agenda, I read about it months before our honeymoon. It was everything I hoped it would be. An amazing selection of books for young and old alike, we bought the kids one of their souvenirs there. We also enjoyed an delicious lunch, this is where I ate vegetarian and had the autumn vegetable hash that I have now successfully recreated at home twice. We purchased a coffee table book for our home from Kramerbooks as well. 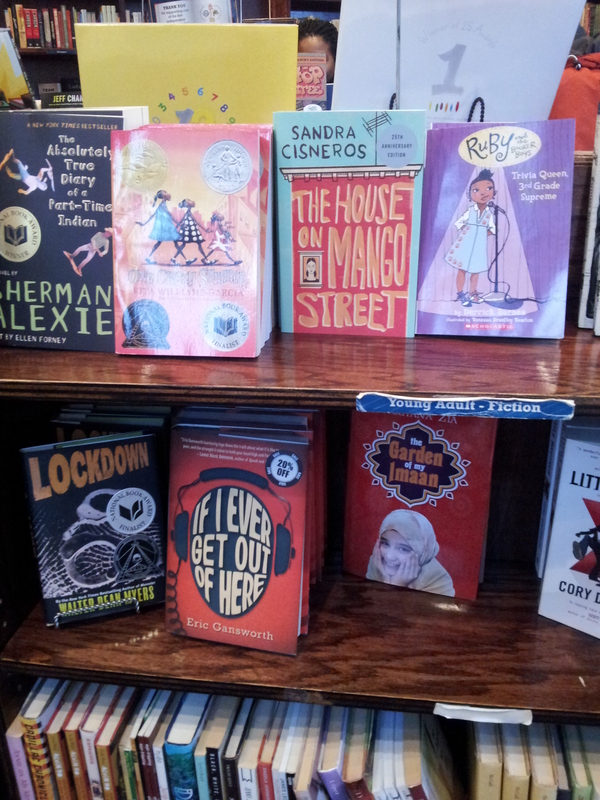 Then later that afternoon we ducked into another book store cafe, Busboys and Poets, in order to take a break from the snow. 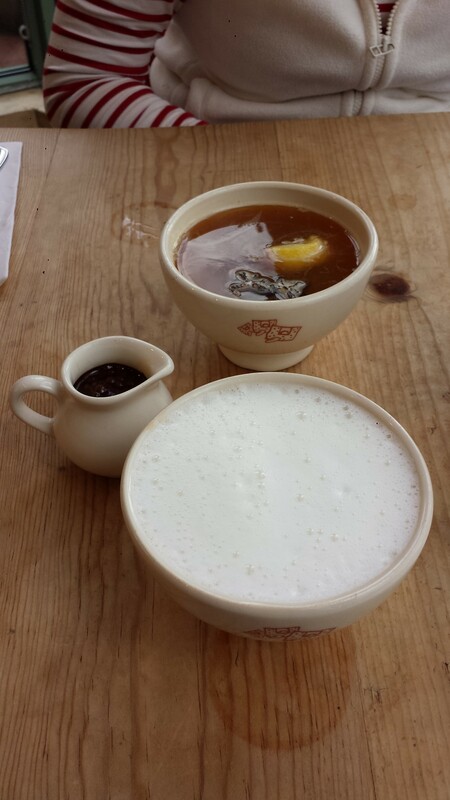 We both got a hot beverage, a tea for me and some kind of coffee creation for Todd. We sat together on an old leather couch near a big picture window and watched the snow fall outside, it was quiet and beautiful, two things I love about winter days like that one. After we finished our beverages we wandered around their bookstore for a little while. 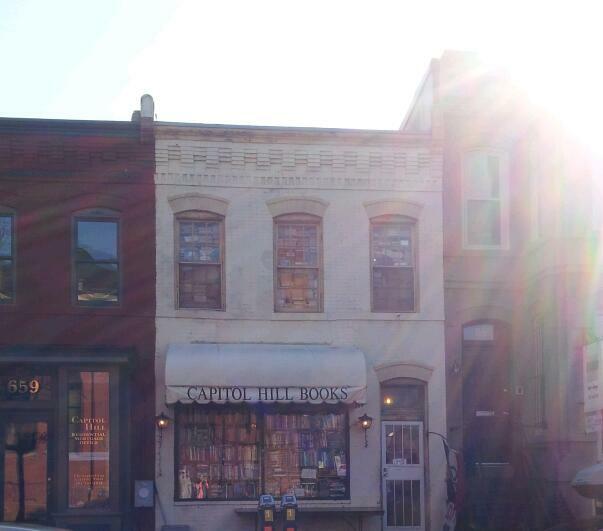 Although it was the smallest we visited while in D.C. it was without question the best. Quality, not quantity. In fact I would go so far as to say it is tied for the best book store I have ever visited. I am also very fond of a book store we have here called Bookmark It. The title is a clever play on words and it is located in the East End Market, a community gathering place Todd and I frequent on the weekends for craft beer and cold pressed juice. These two book stores are similar in that although they are small they are selective about the titles the sell. They are concerned about what people read and offer a different perspective to book buying. I love it. They are both socially responsible book stores. 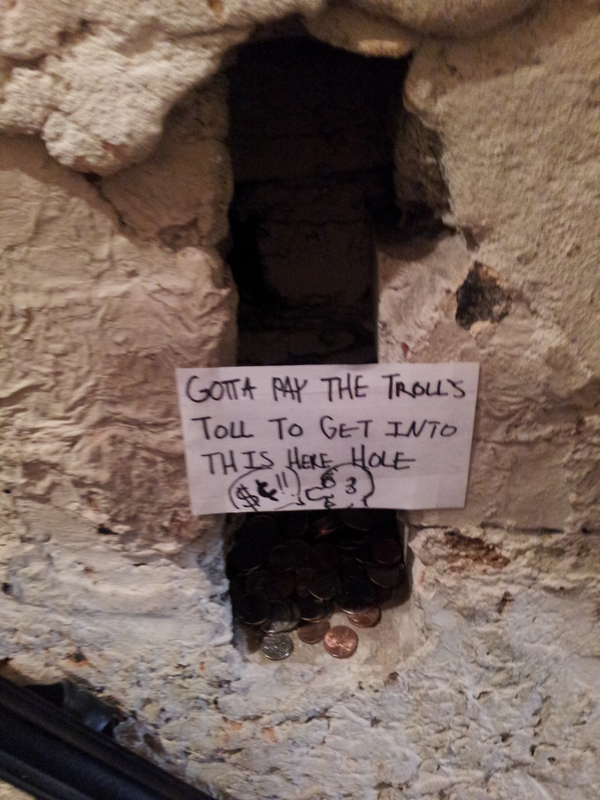 While perusing this is what we found above some of the book shelves. 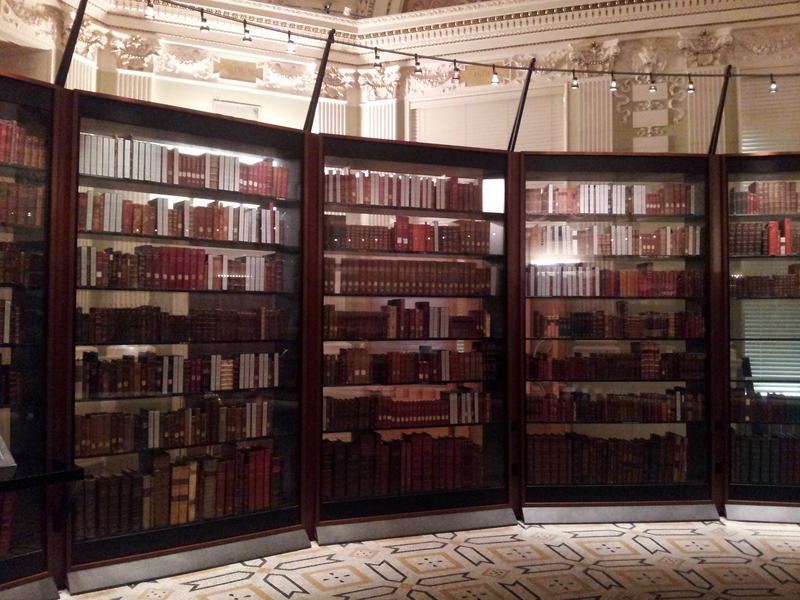 The books on these shelves all had to do with current social issues, those that mainstream and those that are not. There children section was one of the best I have ever seen. My inner social worker was elated. As busy as our honeymoon was Todd and I did have plenty of time to sit quietly and just be together. 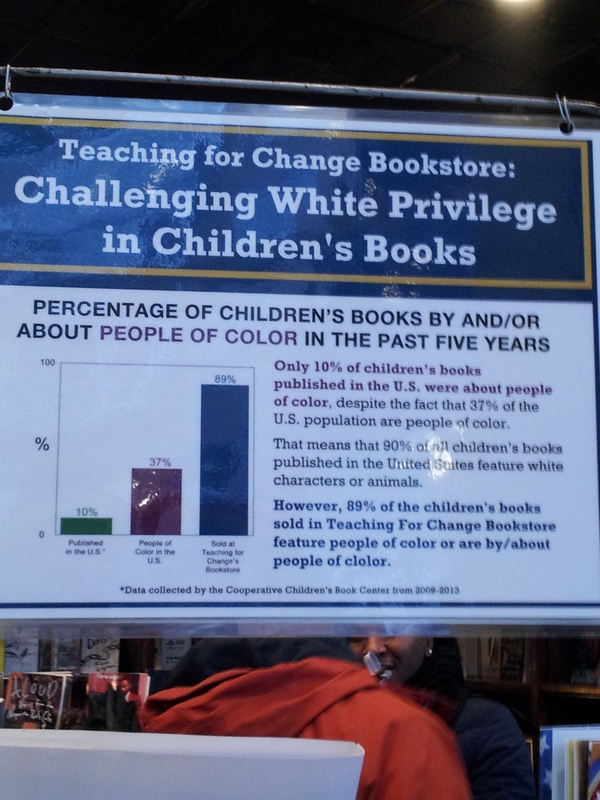 On more than occasion it was in these book stores we visited. I love that we share this love of books and thirst for information and understanding. Our honeymoon was so us. We learned so much and tried new things, we got to explore and just be quiet together. It was romance our way and it was wonderful. Posted in UncategorizedTagged Activism, book stores, honeymoon, INFP, introvert, istj, Literature, romance, Social Work, washington d.c.
Aside from being my birthday Tuesday was also my last day of classes. Now that the semester is finished I have time to get a few things crossed off my To-Do list before we leave for Chicago. Yesterday was only mildly productive because my parents came over for dinner. I spent yesterday morning straightening up before my mother arrived in the afternoon and then she and I ran errands until the boys were off work. Today was my big day to get things done, and I have accomplished a lot. My time working around the house has been riddled with interruptions, however. three to be exact. 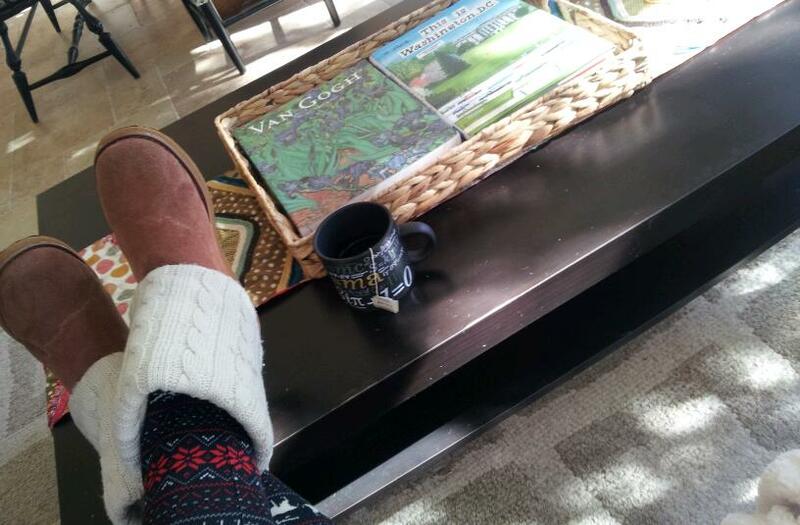 After the third one I decided it was time to change out of Todd’s pajama pants and college t-shirt because clearly I am not having the quiet day at home I had hoped for. The first two were fine, aside from the immediate feeling of panic I get every time my door bell rings unexpectedly. The third was a problem. The first interruption came while I was dusting, no big deal. It was a gentleman from next door letting us know that the work they are doing on the house will last for a week and will be starting early each day. The people next door sold their home about a month ago so this was the new owner just coming to introduce himself and let us know whats going on next door. We chatted for a few minutes where he explained he is not living in the house yet because they are doing major renovation. He said we should only see them early morning to mid afternoon while they are working and then they will be moving in (hopefully) at the beginning of next year. Upon coming back inside I thought, man I sure wish I hadn’t met our new neighbor wearing my husband’s pajamas. Oh well, what can you do? The second interruption came when I had taken a break and was watching a documentary. This time when I heard the door bell my reaction was less of [panic and more of annoyance, what now? I paused the documentary and headed for the door, the whole time contemplating changing first but then deciding against it. I answered the door to a little blond lady explaining that the park next to our house has been chosen to film an Allegra commercial so she, as part of the production staff or something, has the responsibility of going around the neighborhood and making the neighbors aware. She also needed me to sign off on something showing that I had been informed. Neat, no problem. The third disturbance was just that. This time I was changing out the laundry so when the door bell rang for the third time I had a load of laundry in my arms that I was transporting to my bedroom to be put away. There was no opportunity to change out of Todd’s pajamas, I would have to go to talk to another stranger this way. I dumped the load of laundry on the couch and headed for the door, Lucy in tow. That is a detail I have left out of the story so far, each time I answer the door I have to step outside and shut the door behind me so I don’t have to deal with Lucy. Otherwise she would be fighting with me to get outside and see the person on the other side of the door. So, I answer the door and, to my chagrin, it is another unfamiliar face. I was really hoping this time it would be a friend or family member that was in the area and just stopping by, I was over talking to strangers, especially dressed like a bum. I step outside, close the door behind me and right after I do this I hear Lucy jump on the front door. I ask how I can help the gentleman standing in front of me and he asks to speak to my parents. I tell him that I am the home owner and that my parents do not live with me. He became flustered and started apologizing, then he started lying. He starts by saying he came by yesterday evening at 6:30 but no one answered the door so he went to our neighbors house and had a nice conversation with them. I stopped him and said, that’s strange because we were home last night and at 6:30 we even happened to be outside. How did we miss him? (My father arrived at our place around 6:20 just a few minutes before Todd. We were all outside helping him bring things in from the car. Then we stayed outside and spoke with our next door neighbor for about a half hour. We he had not seen our neighbor since the wedding so we were catching up. This guy’s timeline did not make sense). He got flustered again and started talking very fast saying Oh I must have just missed you but that is OK because your neighbor over here (pointing to the vacant house that is being worked on) was home, in fact I interrupted her during dinner and we had a nice long conversation. I stopped him again and asked, which neighbor? This house here? (pointing to the empty house) To this question he replied Yes. I explained that no one lives there currently and then looked at him puzzled while I asked, what is it that I can help you with?? After mumbling something and fiddling with some papers he was holding he started back tracking saying that he meant the neighbors on the other side. To that I said, no woman lives on the other side (we live next to a gay couple). He then asked me if I know all my neighbors, to which I replied Yes and asked again, sir can you please tell me what it is I can help you with? I am busy and really need to get back to work. He said that he was a Big Brother and that he mentors inner city youth and that the only way he will be allowed to continue to mentor is if he gets signatures from people supporting him. I was lost, what on earth is he talking about? How are signatures from strangers going to validate his ability to be a good mentor? This makes no sense. He was talking too fast for me to get a word in to ask a question. He then explained that all of my neighbors had agreed to support him and signed his sheet and then he asked if I would as well. With this he gave me a crumpled up packet of paper and asked me to sign on page three. I turned to page three and saw a list full of signatures, upon inspection I did not see one name I recognized. Now, I don’t know ALL of my neighbors but I do know the 8 that live closest to me. When he saw me looking confused at the paper he leaned in and pointed at the blank line where he wanted me to put my name. I stopped him and said, I don’t see any of my neighbors signatures here. Which one of these signatures is one of my neighbors? He started to say he has spoken to everyone on this block and everyone has signed his sheet. I flipped to the next page to see if there were more names and all I saw were pictures of magazines. Suddenly everything made sense. I asked if by support he means he needs me to buy something? He said No, that I can make a donation, I don’t have to buy anything if I don’t want. So I rephrased the question, are you asking me to spend money? Yes. I handed him back his paper and told him that I was not going to be spending any money. With that he thanked me for my time and asked me if I knew if my neighbor was home so he could speak to him? (I was thinking, you just said you already spoke to all my neighbors!) I said I was sorry I did not know and he left. What a colossal waste of 15 minutes of my life! I was beyond aggravated, it was just lie after lie to try to guilt me into buying a dumb magazine. “All your neighbors are doing it” “I came by last night but you didn’t answer the door” “I mentor inner city kids and unless you support me I wont be able to continue“. The last one is where he would have got me too because what he is claiming he does is really important. Now I don’t know whether to believe him because he lied about everything else and tried to trick me into buy something rather than just being honest from the beginning. It’s like he was just lying through his lies until he came out on the other side. Ugh. After he left I got my mail from the box and turned around to go inside, fat chance, I was locked out. Locked out in Todd’s pajamas. Of course. Apparently when Lucy jumped up on the door after I first stepped out she some how managed to lock it, just my luck. I walked around to the garage door, punched in the code and let myself back into the house where Lucy was sitting by the door waiting for me. What a debacle. Needless to say I am now fully clothed finishing my chores just in case. I went to bed teary eyed last night in Todd’s arms still effected by the news of the day. As we laid there together my mind wandered back and forth from what was going on with the situation and what I had to do to prepare for my final exam the next day and the fact that in a few hours it would be my birthday. I asked Todd if he thought birthdays were less special the older we got. He said yes, that he guessed so, explaining that when you are a kid that’s all you have, that and Christmas. There is nothing big really going on in your life, that is why it feels like such a big deal. As you get older, he said, there is so much other stuff happening in your life that it maybe isn’t quite the big deal it was years prior. Although honest and probably mostly true, his answer made me sad. I have always thought birthdays are a big deal, other peoples at least. I don’t mean buy-the-person-a-million-balloons-and-make-a spectacle-out-of-them big deal, more like I-am-so-thankful-you-were-born-and-we-get-to-hang-out big deal. In that sense I think birthdays should always be special. It is the one guaranteed day of the year that people remember to be thankful for other people. When I am saying Happy Birthday to someone what I am really saying is, I love you and I am glad you are alive! Your birthday is your guaranteed day, it’s about you and people being thankful for you. So I guess somewhat opposed to what Todd said or maybe just restating it in a slightly different light, I do not think birthdays become less special as we get older, the meaning just changes. Or not even that the meaning changes, but as an adult it becomes less about the fanfare and more about the actual meaning. Yes, I like that last explanation best. Honestly this year, from where I stand at least, my birthday has been a bit of an after thought. I mean I just got married, took a honeymoon, am getting ready for another big trip, plus it is exam week and I have a final exam scheduled for 7pm on my birthday. Not to mention I am turning 31, what is there to be excited about, it is kind of a boring in between age right? Wrong. My birthday started off very special and it totally infused a level of enthusiasm back into the day and about what it should mean. So with that I would like to count my gratitude on why I am personally glad I am alive and get to celebrate being 31, which I am quite sure will turn out to be a very exciting age. – My family, our relationship, how we support each other and balance each other and accept each other through everything. – More specifically my mother for her bravery in raising a strong willed, at times completely impossible, little girl into a strong willed, principled woman. – My husband. I have gratitude just for being able to write that word, husband. For his kindness and support and encouragement. For his understanding of who I am at my deepest levels and his love for everything I am. For all the things (big and small) that he does for me and most importantly his friendship. – My new family and their total acceptance of this passionate, sensitive girl into their family. – I am grateful for the last year, settling into this wonderful house together and making it our home, adopting what has turned out to be the sweetest rescue boxer we could have hoped for, being accepted into my program and maintaining straight A’s throughout the semesters, the volunteer work I have been fortunate to be involved in this year especially with Hospice..
– And finally the direction my life is taking. We don’t have every detail of our future planned out but I am excited for whatever comes next. Work, children, travel, school, who knows.. I have mentioned, on more than one occasion I suppose, how I do not care much for texting. Here is one reason to add to the ever-growing list of why I feel this way about this particular technology. Today was my first day back at Hospice, it was a lovely day. I had missed MaryLou, my 80+ year-old counter part whom I have come to regard as a dear friend. Not to mention the IPU itself and the role I play there, and of course my mentor. It was a nice first shift back. Towards the end of my shift I pulled out my cell for a moment, I was expecting a response from my girlfriend about dinner plans we are currently orchestrating. Upon unlocking my phone I found that I had multiple missed text messages from family. I was alarmed, this was unusual. I checked the first one, it was a simple “Are you busy? Can you talk?”. I decided to wait to check the others until I had completed my shift, my parents and Todd have my number at Hospice if it were an emergency they would have called and because they did not I felt that any other news that was maybe important but not emergent and possibly negative in nature would just distract me from my duties. There were only 15 minutes left to my shift anyway, it could wait. When I left Hospice I had all but forgotten about the pile of text messages until I went to plug my phone into my car charger. I picked it up to call my sister-in-law back but decided I would check the other messages first. Here is the part where I don’t like texting. It was shocking news, news that I took very hard. That is NOT the way to deliver that kind of news to a person. For example, this is not what happened but here is a scenario, a person’s father dies in an accident and you cannot get a hold of them.. You do not text them and say “your father died, call me asap.” That is awful. ” You say, I do not want to startle you but there is a family emergency please call me as soon as you get this message.” Gosh, I don’t know maybe that is even a little much. One way or the other you have to be careful what you put in a text, they are not delicate, they are just there, in your face. It is the bluntest form of bad news. I immediately called my sister-in-law as instructed to find out what exactly was going on. That is the most I feel comfortable sharing about the news I received today. Like other cases of bad news before it, it is not mine to share therefore I choose not to divulge any details. I do need to release some of what I am feeling right now though and after some consideration I have decided to allow myself to do it here. I read something while at Hospice today and it resonated with me so much that I copied it down and put it in my purse, not knowing at the time that it would have further significance to me so soon after stumbling upon it. The stories we love are filled with struggle, conflict, and failure, yet so often the stories we present to others are a highlight reel of accomplishments, perfect meals, and sunny days. This excerpt made me think a little bit about society and myself of course. We put our best face forward at work, school, online, in social settings. We all strive desperately to have the rest of the world believe we are happier than we are, wealthier, more successful at work or in school, more loved or admired. I would be willing to wager that at least one of these items I have listed is true for everyone, I know it is the case for me even though of course I would be more comfortable not admitting that, if not these than something else I didn’t think of. The point is we fake it a bit. It goes back to vulnerability and what Brene Brown says about wearing armor etc. Whether it is because we are in some fruitless competition with the rest of society or just trying to save ourselves from the judgement of the outside world, we all, at times, omit truths about our lives. We all run that highlight reel and sell it as the whole picture. So with these words ringing in my ears and a knot in my throat from emotions I have been trying to swallow all afternoon I have decided to share a little more than my highlight reel, I have made an agreement with myself to allow myself to be vulnerable. Now although I cannot share specifics about the situation I can at least share how devastated I feel. When I read that text message today I felt like the wind had been knocked out of my lungs. After gathering as much info as possible I felt overwhelmed. I felt regret, worry, frustration and deep deep sorrow for another person. There is nothing I can do about what is going on, it is truthfully none of my personal business, although I may be affected later by the outcome. All I can really do is wait and see and be supportive to everyone involved. There is one person though that I worry for so deeply. I just hope someone, just one person at least has that person’s best interest in mind. I hope at least one person is in that person’s corner. I wish for that so desperately. All afternoon since returning home I have done my best to busy myself as a way to distract from the ever-growing lump in my throat. I kept telling myself I just have to keep it together until Todd gets home then we can talk about it and I can let everything I am feeling out to be processed. I read emails, assembled our Christmas tree, started dinner early attempting to lose myself in the catharsis of vegetable chopping as I sometimes like to do. It was no use, half way through watching It’s a Wonderful Life I started to cry. Life isn’t fair and I don’t care if I do sound like a five-year old in the midst of a tantrum when I say that. It’s true. Some people get a raw deal with little chance to overcome it and just isn’t fair. I wish Todd would come home already. My heart is so broken in this moment and I need some help to see past this hurt. The museums and exhibits in D.C. were interesting and certainly worthwhile but I have to say with all we did while in the Capitol they fell far from my favorite. At the top of my list was the bookstores, exploring the neighborhoods and of course the wildly imaginative, thoroughly delicious food. 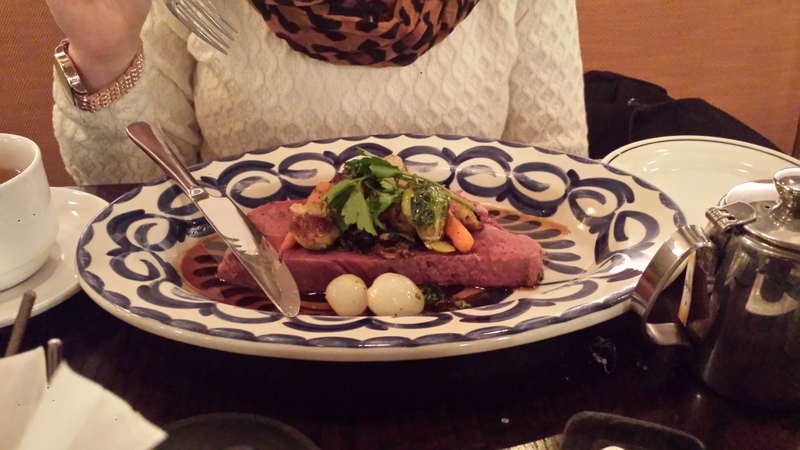 This post is specific to our culinary adventures while in the city, we had many. 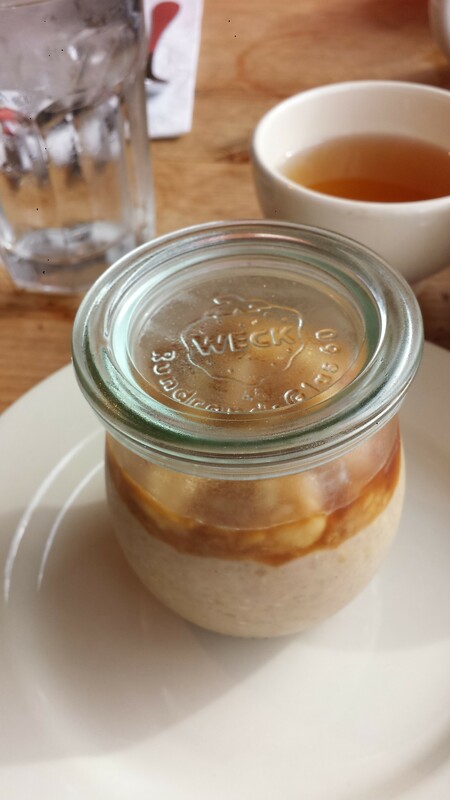 We tried to eat healthy as often as possible and in D.C. it was not actually that difficult. Sweet Green– What we got: Todd- Fall vegetable salad that included sweet potato and brussels sprouts. Me- Curry Cauliflower salad that included quinoa and cranberries. 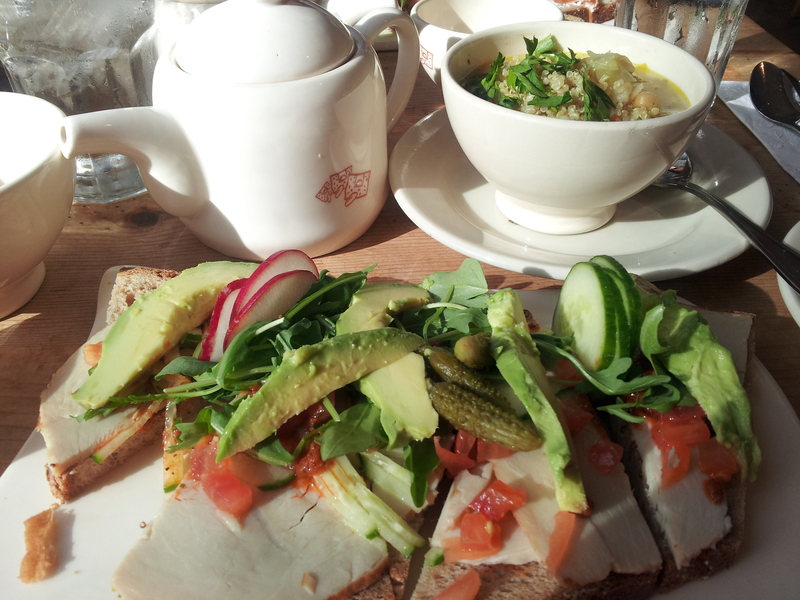 Le Pain Quotidien– My personal fav. and the only place we went twice (that is how good it was). 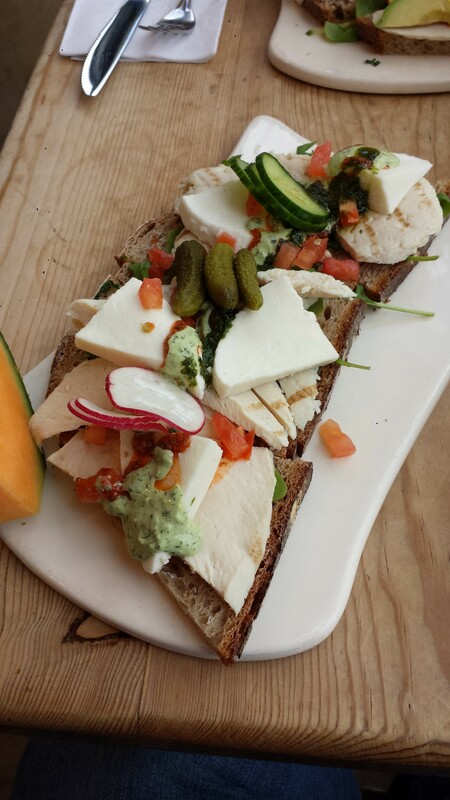 What we got: Todd- Open faced sandwich with mozzarella, chicken and assorted veggies. Me- Turkey open faced sandwich with avocado, hummus and assorted veggies. 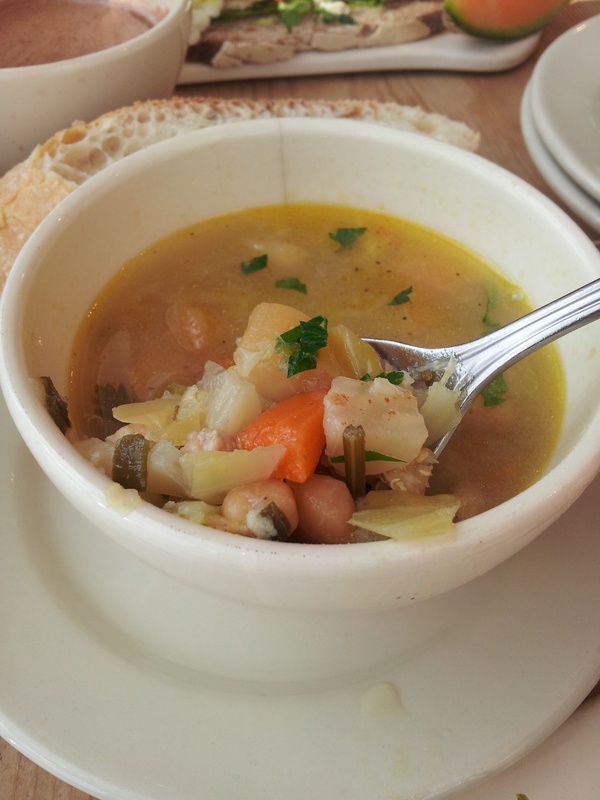 Organic chicken quinoa vegetable soup. 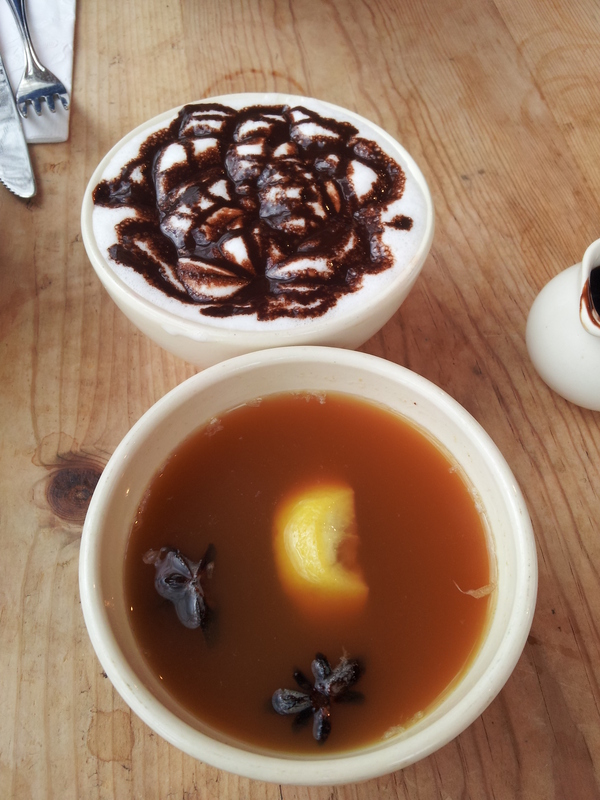 On our second visit to Le Pain Quotidien Todd got a very decadent hot coacoa along with a brown rice pudding. 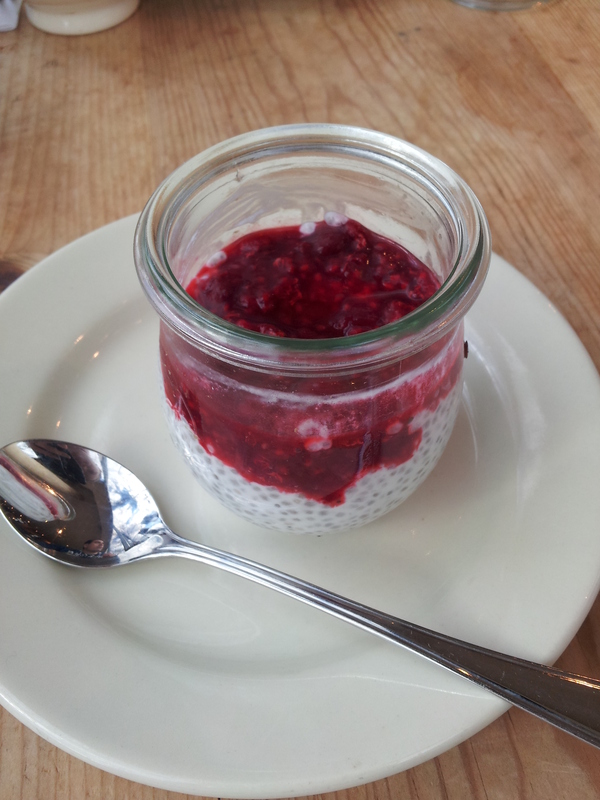 I got a chia seed pudding topped with raspberries and an orgainc spiced apple cider. We both got a pastry to go for the next morning as well. Todd got an apple turn over, I got a chia seed muffin. Woodward Table is where we went for dinner our first night in the city. What we got: Todd- Carolina Trout. 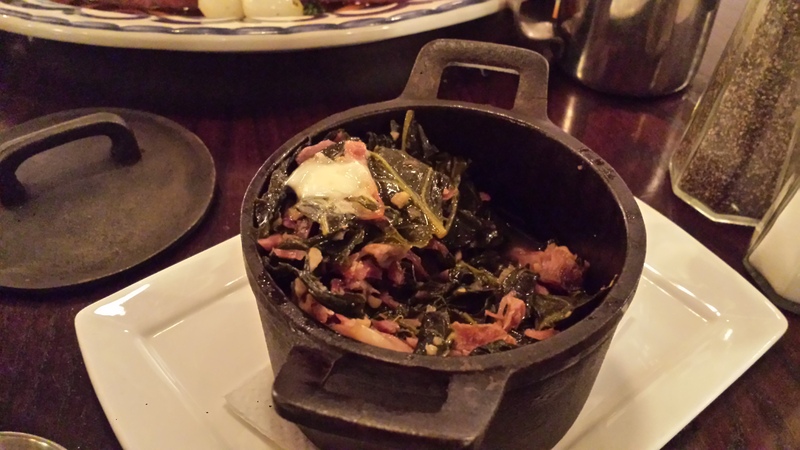 Me – Corned Beef with assorted vegetables and a side of collard greens (my all time favorite vegetable) to share. 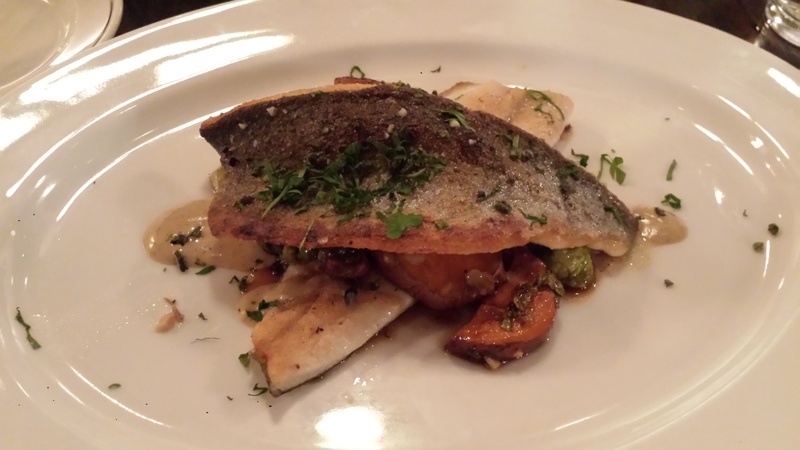 Our favorite dinner restaurant by far and away was Birch and Barley on 14th street. It was a farm-to-table restaurant with a flare. 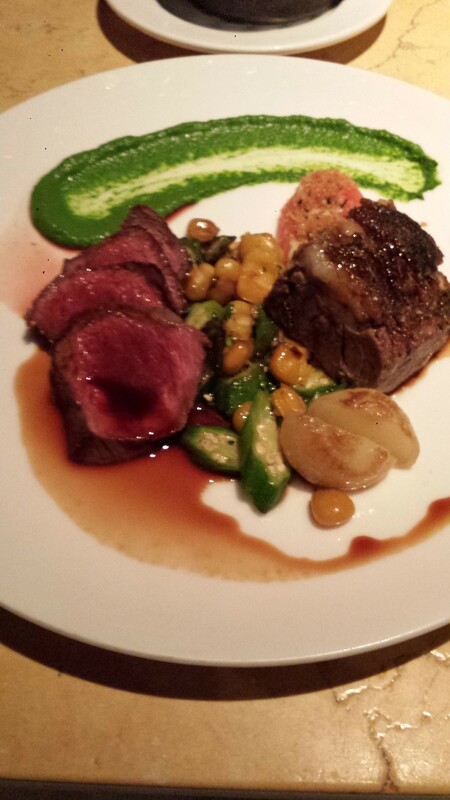 What we got: Todd – Seared beef rib-eye and short rib with assorted vegetables. 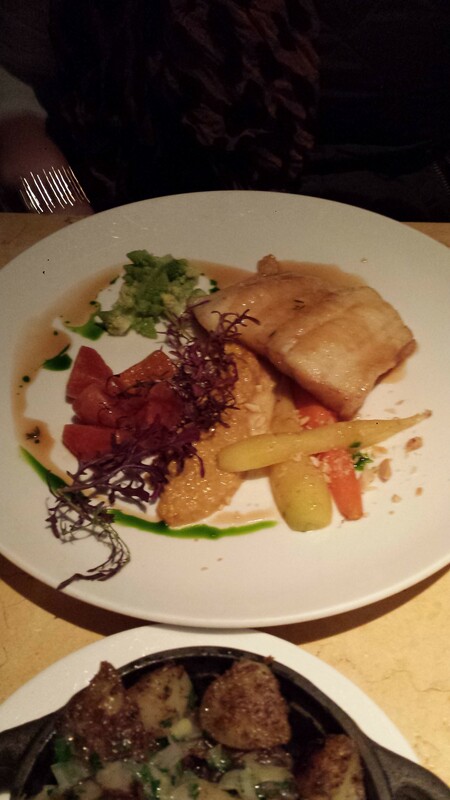 Me- Pan seared wolf fish with beats and carrots. 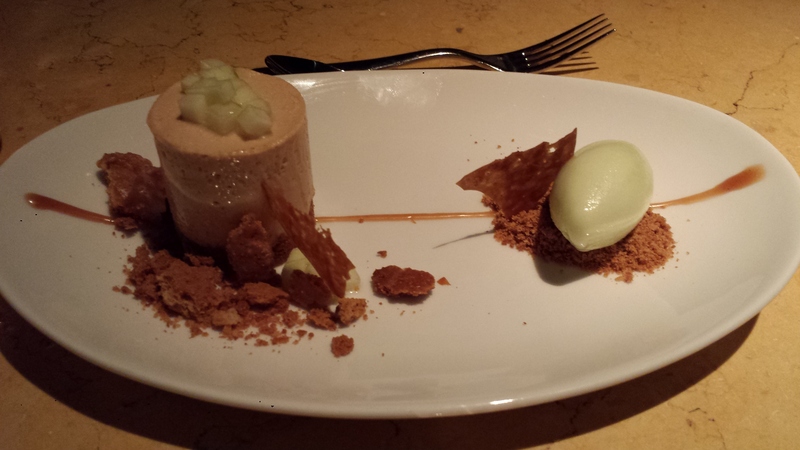 We also got a deconstructed apple pie for desert. Finally my favorite lunch of the entire trip came after a day of not enough vegetables. We had limited lunch options on Thanksgiving and dinner that evening was German. Although dinner was amazing I got next to no veggies that day and I am a protein on the side girl, half the time I eat vegetarian just because I love eating vegetables. A day without vegetables for me is like a day without honey for Pooh. So Friday we stopped in at yet another bookstore, and I do not say this with any exhaustion because the bookstores were a true highlight of the trip for both of us, we came home with lots of books. So at Kramer Books and Cafe we bought some more books and stayed for lunch. I ordered vegetarian and did not regret it, it was a vegetarian sampler. 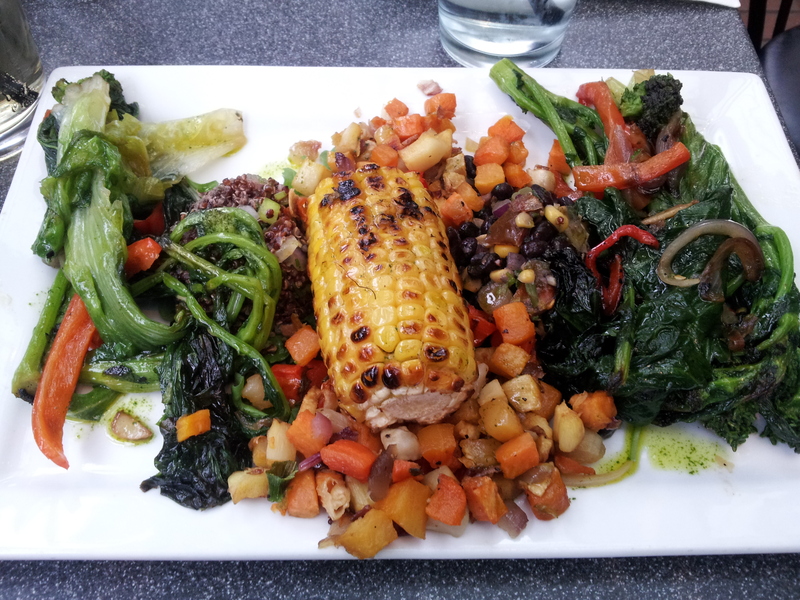 Kale, Bok Choy, Red Pepper, Autumn Vegetable Hash and Roasted Corn. I was in veggie lovers heaven. I have recreated the hash twice just since we have been home. The one I make is slightly different. There’s was carrot, turnip, sweet potato and onion. In mine I use those vegetables and added apple, rutabaga and purple potato. I will admit it is a little heavy, to be consumed in smaller portions for sure but it so good. I made it tonight with my organic Chic Fila Chicken recipe and from scratch apple sauce. All of the amazing meals we had while away have inspired me to get creative in the kitchen since being home. I have made lentil soup, the chia seed pudding I had (which is perfect for breakfast because it is just almond milk, chia seeds and raspberries), and this evening Todd and I made his brown rice pudding following a recipe we found online. We have yet to taste it but it smells divine.